Anchors in concrete have several different modes of failure when subject to tension or shear loads. Concrete breakouts in tension tend to get the most consideration since the calculations can be more complex depending on various geometric constraints of anchors or anchor groups. For anchor groups in shear, concrete pryout may also be of concern, especially when anchors are short and stocky. At what point does concrete pryout no longer become a design consideration? 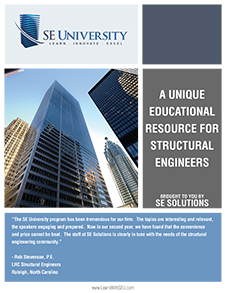 In August 2018, Donald Meinheit, PE, SE, from Wiss, Janney, Elstner Associates, Inc., presented Behavior and Design of Anchors in Concrete for SE University. In Part 1 of a two part series, Don covered the different types of anchors, the behavior of anchors in tension and shear, and the various failure modes in tension and shear. Don addressed a question at the end of the session regarding which anchors were prone to concrete pryout failures in shear. Being familiar with the ratio of the effective embedment depth of the anchor to the diameter of the anchor can help in determining which failure modes will control the design. In normal weight concrete, if this coefficient is greater than 4.5, then concrete pryout in shear is no longer a concern. The short video below features Don addressing the issue of failure due to concrete pryout, and explaining when this failure mode is applicable.